Yesterday, on a drive to visit relatives I inadvertently tuned into NPR's This American Life hosted by Ira Glass. The hour long show was dedicated to a "sort of a real-life Hardy Boys mystery" about a young boy, an abandoned house, and the mysterious family who once lived there but seemed to have disappeared without a trace. Adam Beckman tells a tale about how as a boy in 1977, he and two friends discovered and broke into an abandoned house on Loon Lake Road in the small town of Freedom, New Hampshire. To their delight and amazement, they found it jammed-packed with stuff kids that age would find fascinating. In fact, the house seemed to be a sort of unopened time capsule, containing the personal belongings of the family that abandoned it. There was a stocked pantry, pot and pans in the sink, decaying clothes in the closet, a pair of eye glasses on top of a wallet - all disturbingly intriguing in the fact that these people had "not arranged, sorted, or edited the contents of their lives." It was as if the family simply vanished one day, leaving behind all their possessions, with no trace as to where they'd gone, or why. Reading discarded letters, and pieces of paper that offered tantalizing clues, the boys tried to piece together the sequence of events that might have led to the house's abandonment. Like all kids with big imaginations, and adventure on their minds, they hatched up endless theories of unforeseen catastrophes, including foreclosure, gambling, sickness, and even murder. After a handful of visits, the boys never returned again but did save a few letters and items as keepsakes, and never quite forgot the house or the family that lived there. The second half of the story deals with Adam as an adult, and his trip back to Freedom to finally solve the case he started to investigate as a boy only to find he's not the only one looking for answers. Hear the full episode of House at Loon Lake here. 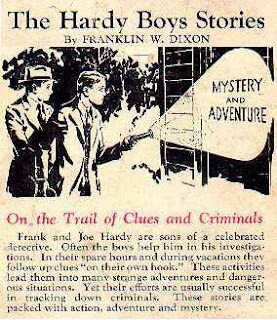 The original The Hardy Boys paperback book series was created in 1926 by Edward Stratemeyer, who also created Nancy Drew, Tom Swift, the Rover Boys and dozens of other memorable characters. House at Loon Lake was a mesmerizing story, but I think it really resonated with me because it so reminded me of my own youth. As a kid I was a tomboy, and used to follow my older brother and his friends around determined to show 'em I had the guts for anything they could throw at me, and believe you me they put me through the test. Every day was a dare, or double dare, as we pushed each other to the limit to see who'd cave first and run home crying. If we weren't supposed to be someplace, that's where you'd find us. When not riding our bikes, we were tramping through the woods building forts, or wading through creeks hunting for crawdads and golf balls, but mostly we were looking for trouble if it hadn't found us first. The thing I relished about being part of the boys' club were the outings, which always included some kind of danger, mystery, and intrigue. At eleven, twelve, or even thirteen years-old, who didn't imagined themselves as an adventurer or amateur detective? Every incident was a potential mystery that needed unraveling, or a puzzle that needed solving, and we had the daring, know-how, and fearlessness to do it. Exploring abandoned buildings and houses was just power for the course. Any place dark, creepy, and mysterious was a favored destination. I think the reason was because at that age you were constantly testing your boundaries, not just your physical ones but the emotional ones as well. We're taught young to fear the dark, and anything that goes bump in the night. But the day comes when you find yourself needing to stretch, loosen, and shed the skin of fear that's really just the last remaining remnants of your adolescence. The false bravado we fronted to the world, and our friends, was nothing more than hot-winded bluster hiding chickenheartedness. Somewhere inside you were always afraid of finding something you didn't want to see, like maybe a dead body, and we all knew it. That's why even as we clung to each other tightly, we were also trying to push one another out front. Because that's what it means to be a kid, kind of stupid, definitely reckless, and always out for adventure. 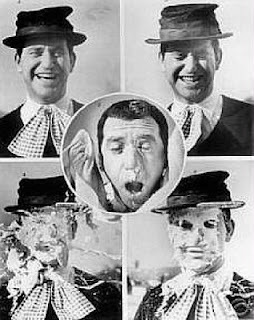 Soupy gets a pie in the face. Fill crust with whipped cream. Set up the throw. It's a good strategy to come at the victim from the side so they don't see you coming. A forward approach might make for better aiming, but be prepared for an ensuing hand-to-hand pie battle. Take aim at the center of the face and throw the pie. Add a little twist and push to get the cream to stick to the victim's face but do so gently.